This week the Kamloops Symphony Orchestra’s latest production, Magic of Vienna, debuts at the Sagebrush Theatre. The production features non-traditional light classical music with an emphasis on the development of melodies throughout. 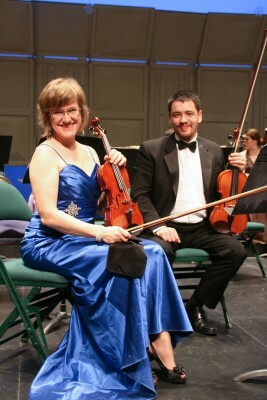 TRU Modern Languages professor Annette Dominik, who is the principal second violin in the production, spearheaded a unique twist for the production. “A couple of years ago I approached the conductor to see if we could wear pageant gowns for this production,” she said. Expect to see the women of the orchestra in beautiful pageant dresses and the stage to be decorated to create a 1900s Viennese atmosphere. While the décor may be a surprise for some concert goers, the music in Magic of Vienna is a traditional waltz or polka style, and some of the music may be recognizable to the untrained ear. “There is a lot of melody and rhythmical things that are very appealing for the first time you hear it,” Dominik said. The production focuses on the evolution of the Viennese waltz throughout history. Listeners should focus on the traditional four-count timing throughout the show. The Kamloops Symphony Orchestra puts this production on at the beginning of each new year as a way to celebrate. This year’s show marks the third time the production has had narration. Rod Michell leads the audience as guest host and narrator. Michell said that, as the narrator, he gives a brief anecdote about where the music was written, something about the occasion in which it was written and something about the composer. It is uncommon for classical productions to give the audience any information or background about the pieces. “This year we decided that we would shape the narration so that it tells in particular about the origin of the waltz,” Michell said. The production is excellent for students, as the music is very light classical, with sweeping melodies. It doesn’t have traditional heavy emotional demands. “The music itself is very approachable. It’s not your stereotype of classical music: very serious, heavy and difficult to understand. Instead, what you’re getting is sophisticated dance music; you’d call it light classical music. You’re getting sweeping melodies and lively dance tunes,” Michell said. Listen for Michell’s favourite piece of the show, an overture that turns into an operetta during the last piece of the concert. In the last minute or so the audience will be treated to the can-can. The Kamloops Symphony Orchestra’s Magic of Vienna takes the audience through a light classical music production of the Viennese waltz. With the added surprises of non-traditional dress and narration, this concert is perfect for any first-time symphony attendees. The production debuts at 7:30 p.m. on Friday, Jan. 15.